Former Indian central bank governor Raghuram Rajan has warned capitalism is “under serious threat” as it has stopped providing for the masses. Mr Rajan told BBC Radio 4’s Today Programme “when that happens, the many revolt against capitalism”. Mr Rajan led India’s central bank and was also a former chief economist at the International Monetary Fund. 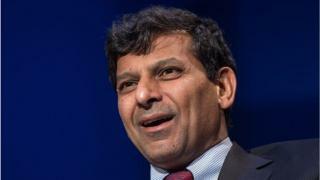 Mr Rajan said it was possible in the past to obtain a middle class job with “modest education”. “Now, if you really want to succeed, you need a really good education,” he told Radio 4. A report from S&P Global Ratings suggests another global credit downturn is possible, with a 50% surge in worldwide debt since the global financial crisis. It said since 2008, government debt has risen 77% while corporate debt is up 51%. Mr Rajan believes that capitalism is breaking down because it is not providing equal opportunities. “It’s not providing equal opportunity and in fact the people who are falling off are in a much worse situation,” he said. He said authoritarian regimes arise “when you socialise all the means of production”. In discussing the state of the global economy Mr Rajan, now a professor at the University of Chicago, also pointed to the challenges of putting limits on the trade of goods.